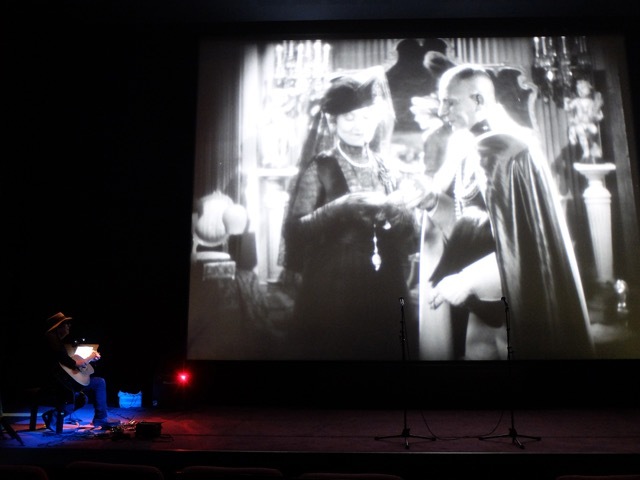 On March 1st GARY LUCAS performed the world premiere of his new live solo guitar score for Erich Von Stroheim’s 1928 silent classic “The Wedding March” at France’s prestigious national film centerLa Cinematheque Francaise. Lucas’ new score packed the Henri Langlois Theatre in the Cinematheque, and marked Gary’s second performance there with a live solo score. Lucas has a long history of accompanying films live with his original solo scores all over the world, which utilize composed themes and improvisation, and has developed over a dozen to date—many of which he is showcasing currently in an ongoing retrospective of his live scores at NYC’s premier arthouse cinema The Metrograph. On Sat. March 9th Gary filled Paris' Sunset Jazz Club in Les Halles with a solo concert, which included a tribute to Lucas’ late friends and collaborators Jeff Buckley and Captain Beefheart (Don Van Vliet). who flew in specially from Rome to preview three songs from a new album they’ve recorded entitled “The Complete Jeff Buckley and Gary Lucas Songbook”. Lucas had seen The Niro perform in Italy several years ago and, impressed by his vocal abilities, suggested a collaboration, which resulted in their new album. Recorded in Rome for the Esordisco label, the album showcases a dozen songs Jeff Buckley and Gary Lucas wrote together, and includes their anthems “Grace” and “Mojo Pin”, plus 5 Buckley/Lucas songs never before officially released. It’s scheduled to come out later this year on Esordisco to commemorate the 25th anniversary of the release of Jeff Buckley’s classic “Grace” album. Other guests for the evening included Gary’s Parisien friends Jean-Philippe Rykiel on keyboards, bassist Laurent David, guitarists David Konopnicki and David Fenech, and singer Yass Body. as part of his ongoing retrospective series at the Metrograph.